They are delicious, sweet and unbelievably easy to make. If you have 3 or 4 extra minutes in the morning you can whip up homemade pancakes that are healthy, delicious and Gluten Free. You can top them with anything you’d like. I personally eat them by themselves since they are sweet and moist. I can’t really take the credit for this recipe. Last week my cousin Taly texted it to me and said “try it for the blog” I didn’t think it would work and was pleasantly surprised by the results. Now my head is spinning! Imagine all the recipes I can derive from this technique. Like these blender muffins! they’re also Gluten Free. 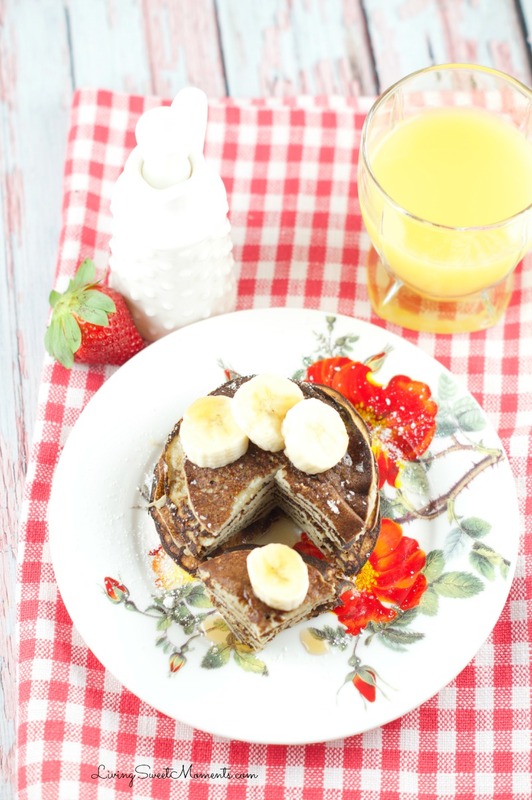 I really hope you can give this 2 Ingredient Banana Pancakes Recipe a try. 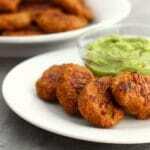 They have become part of our daily breakfast and is much better than using a lumpy mix. Next time I will be adding some Flax seed and/or chia inside the blender. Adding nutrition to my kids without them knowing is my specialty. Oh my goodness I am so sorry about that John! I have made this recipe a million times and yes the batter is liquid but then when I put it in the hot pan it cooks right away! My husband showed it in a video: https://www.facebook.com/fitdadblogs/videos/vb.1483515691932574/1559403861010423/?type=2&theater check it out. Just made these-turned out perfect for me! I topped them with a little raw honey & cinnamon…yum. 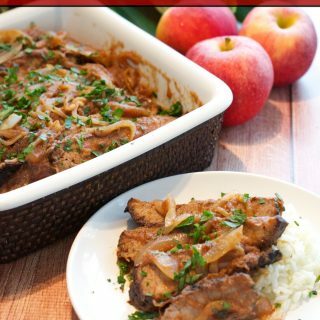 Thanks for this easy, yummy , healthy recipe! Yay! glad you liked it Valin! How many eggs and bananas to feed a family of 7?? I had the same experience. Tried again thinking it was a fluke…same mess of mush in the pan. Oh I am so sorry George! maybe the bananas were too ripe? I think ‘grind’ may be a better description than ‘blend’ – if you do t pulse it too much, the batter won’t be as liquid-y. 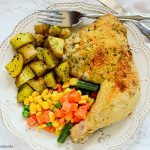 I’ve found it just as easy to mash a banana in a bowl with a fork, add the eggs and stir with the fork – this leaves the batter a little chunky and it holds together better in the hot griddle (or in the hot skillet). Top it with honey and cinnamon (you can even add some cinnamon to the batter) and you’ve got yourself a tasty breakfast!! (And this is the only way my 2-year-old will eat eggs! – AND I usually put in half a baby food jar of veggies and the kid never notices! …as long as you add cinnamon to the batter to hide the green color the batter may become with certain veggies) We’ve been using this recipe for years now!! Wow! that’s awesome that your 2-year old likes them Sonia! I know how hard is to get toddlers to eat. Thanks for the grinding tip. Oh so sorry Gumbalina! 🙁 Maybe the pan wasn’t hot enough? Maybe you flipped them before they were cooked? Remove the blender step. Just mash the bananas then stir in eggs. Cook like a pancake by the spoonful. Works perfectly for me and my LOL loves them. Awesome! Glad you liked it Kelsie! They were great! I thought they might be eggy trading but definitely not! They are fantastic! Glad you liked them Melissa! thanks for your feedback! I came across this recipe on Pinterest, I am not an egg person and I was worried they would taste to much like a fried egg but I love pancakes so I gave it a try. I just smashed the banana with a fork on a paper plate then added it to a bowl with the two whipped eggs since I don’t currently have a blender. They tasted better then I thought they would, mine came out a bit dark but I think I left them on to long before flipping. I can’t wait to try them again! That’s awesome Amanda! I am glad you liked them! My husband asks for this breakfast at least 3 times a week. I just made them and they looked just like pancakes and were so good! My husband was skeptical but was surprised they were delicious,! Yay Lucy! I’m glad you and your husband liked them! Thanks for stopping by and letting me know. Have a great day! So sorry you didn’t like it Larisa. Thanks for stopping by! Do you recommend cooking these on a pan with teflon? I cook in cast iron only and just wondered what the difference might be as far as time I should wait before i flip them, or if i should get a teflon pan for these. They look so good! Hi Theresa, yes I would recommend a nonstick pan and spray nonstick spray before adding in the pancake batter. Turn them when you see bubbles on the top part of the pancake. Let me know how they turn out! May I know if these pancakes can be frozen? Thank you. Hi Kristal, I’ve honestly never froze them before so I can’t tell you if that will work. I tried this recipe today, I was very excited to try a healthier pancake but the result was awful!!! Very soggy and mushy I was expecting a certain crisp and this certainly didn’t have it! Oh Kathy I am so sorry you were disappointed. Thanks for your comment. 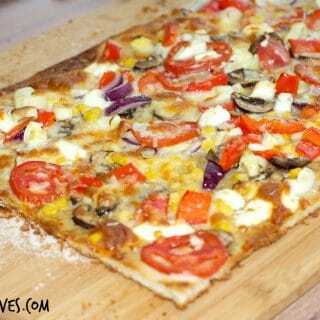 Omg so yummy – and worked! I made one huge pancake and it was superfluffy… a bit wet but ok to eat with fruits. So fast to make. I am so glad you liked then Marion! thanks for stopping by! Yumm that sounds delicious Teri!! 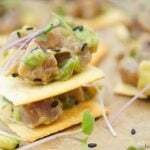 Thank you so much for trying this recipe out & letting us all know how great it is! I am so glad you and your kids like them Sarah!! We eat them all the time around here. These were so easy and good! I used my nutribullet ( don’t have a regular blender) and added 1tsp of pumpkin spice and 1tsp of natural vanilla extract. PERFECTION!! Awesome Debbie! I am so glad! thanks for letting me know.. I’ll try the pumpkin spice next time, sounds delicious! I made mine using the nutribullet as well (didn’t want to drag out the blender). they were very hard to flip and did resemble scrambled eggs when i was done. i was thinking my banana was TOO ripe. I would try them again with a less ripe banana. I added cinnamon which was good. They are sweet enough that you don’t need any syrup. i love bananas & eggs. will give it a try in the morning. seems it could be a base for a lot of experimenting. This is not a recipe I will try again. There’s almost no way to flip the pancakes because you can’t get the nonstick spatula under the pancake without guncking it up. It does help to spray with nonstick spray, but you didn’t say to do that in the actual directions. I’d like to have had a video of me doing this. Way too much trouble. The taste is ok, but you definitely should love bananas. I think most importantly, your family finds that these are a delicious and healthy breakfast and that they are an easy staple in your home now. When one finds that, it is gold! For me, these did not work. I agree with the posts above. They simply tasted like a flat banana omelet and had a very slimy and rubbery texture. It would be an easy fix to make crepes though. I don’t know why people are disappointed with the recipe. If the main ingredient in a recipe is banana, then it’s probably gonna taste like banana. And it was a bit gooey, but nothing that would deter me from making these again. And you gotta think.. Bananas are gooey. So you can’t expect a banana pancake to taste/feel exactly like a flour one. Thank you for posting this! I will for sure make these again! Hi Chelsea! Thanks for your comment! I’m glad you liked them. I’ve never tried using just one egg, I will surely try it this weekend! Yay, it worked! So simple yet so delicious! Awesome pre workout meal/ breakfast! I am so glad Carmen! Thanks for stopping by! For what its worth I made these today and they were OUTSTANDING!!! A new favorite. Thank you Tiffany!!! s was so frustrating! I had friends visiting for Christmas morning and decided to try making these as a treat. Huge mistake! They were mushy, no matter what temp I cooked them at. I could hardly flip them, even in my ceramic none stick pan sprayed with cooking spray. They completly fell apart. I gave up after attempting 6 times and made bacon and eggs. It definitely would have been helpful if you put some tips or tricks in the directions or at least mentioned that flipping is sometimes challenging. 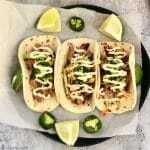 I just tried this recipe and they were great! I was looking for some clean eating recipes and came across this on Pinterest. I love that i can eat pancakes when my husband and kids eat regular pancakes. I put a little natural peanut butter on top. Delicious! And I cooked mine in a cast iron skillet and they turned out good. I think the key is having the pan hot enough. Hi Lin! I am so glad you liked them! Next time I’ll try them with peanut butter, the combination sounds delicious! My kids loved these. They came out great, we didn’t even taste the bananas and they weren’t gooey like some others have experienced. It did take some trial and error and playing with the pan temperature to get them right. We made them with 5 bananas & 12 eggs and added cinnamon, vanilla, salt and about 3-4 T sugar. Blended on high for a while. Buttered the pan before each batch.. Served with frozen Costco blueberries and whipped cream. I am so glad you loved them, Kim! The blueberry and whipped cream sound amazing! thanks for sharing! Delish, for a slightly thicker batter I added flaxseed meal, cinnamon, and a dash of nutmeg, and a drop of vanilla doesn’t hurt . Yum great tips Mike! I will definitely try the flax seed and vanilla! Tiffany – made these this morning! 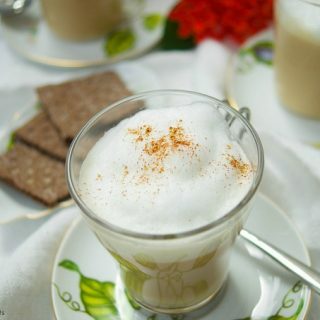 1 egg and 1 banana – mashed the banana with a fork so still a few little lumps..then added egg, I put a dash of cinnamon. I used a CAST IRON pan with non stick spray. It made 5 palm size pancakes that turned out EXCELLENT! I waited and did not flip until the edges were browning..that is the key, no stick and flipped great! Thanks so much for the recipe! NEW STaple in our home! I am so glad that you liked them Melissa! Thanks for those great tips! YUM!!! New favorite breakfast. Healthy and delish. I also waited until the edges were brown to flip and sometimes had to use two spatulas. Also,, used a large spatula and slid the pancake from the pan to the spatula and then turned it over back into the skillet…that was the best looking pancake I made.. The correct temp of the pan is critical, I burned a couple when I tried to rush it, but they still tasted awesome. Experimented on myself this morning, will serve for the family tomorrow. Used a small Le Crueset skillet with non-stick spray and made the pancakes the size of the skillet. Thanks for sharing your experience Sara! Dang, I forgot to rate it a minute ago. My husband and I are big fans of pancakes on Sundays. I try to do a different variety every Sunday. 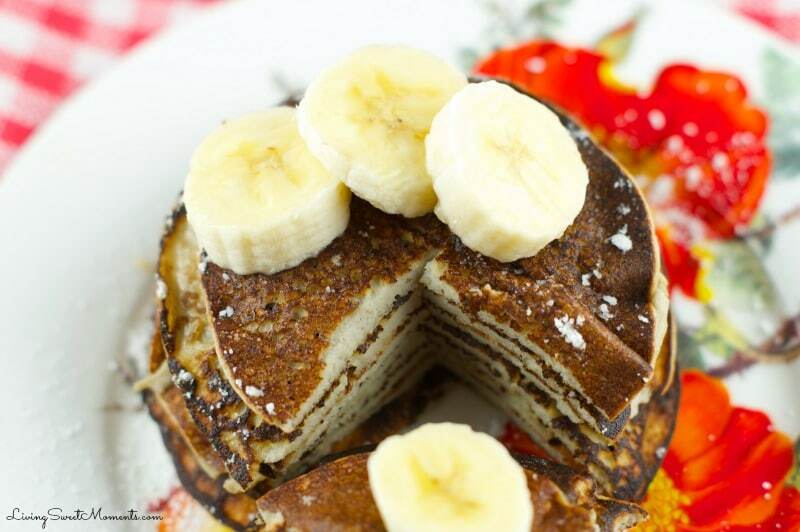 We love banana pancakes so your 2-ingredient pancakes sounds very intriguing. Definitely going to give them a try. That’s great Linda! let me know how they come out. Very yummy!! They weren’t the prettiest, but they were delicious and my toddler ate them. I didn’t find that I got better at flipping them overtime and getting better results. I care more about a healthy breakfast with simple ingredients than how pretty they look. Thanks for the recipe. You’re very welcome! I’m glad you and your toddler liked them Darlene! These pancakes were just a total flop..did not set up enough to flip and just a mess. Will not try this one again. So sorry it didn’t work out for you Sandi. Have you tried this in a waffle iron? Wondering if cooking it from both sides might make them flip-free? Or might make a mess? Haha. These were tasty, kids liked them too. Difficult to flip, def. needed to keep the size down to 4″ max. A waffle iron! Brianne you may be up to something. That sounds like a great idea! Unfortunately I don’t own one, but if you do, give it a try and let me know how they came out. I’m glad your kids liked it! Yumm Nutella on top sounds delicious! I’m putting this together in my new blender this morning before going out to work in the yard, putting blender and all in the fridge (maybe that will help with the trouble some people had) to cook in my new coated electric frying pan – my thrift store one I’ve used for years finally died, so I gave my Scottish shelf permission to buy a brand new modern one. I’m still getting used to it so the comments also helped, heat it hot enough. I don’t have a stove and only a large toaster oven but I have every electrical cooking appliance known to woman (almost, LOL). My husband gave me a banana too ripe for him (he’s picky) to put in the fridge so I’ll add some flax seed meal and maybe some quick oatmeal. He won’t be up for hours but for a change I’ll be ready with a quick breakfast. Thanks! Your welcome Jodi! Thanks for your comment and have a great weekend! 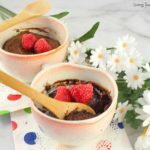 I love making these, I tend to add a bit of protein powder to thicken up the batter (and balance it out a bit) then I layer it in tons and tons of peanut butter! SO delicious! Thanks so much Breanne! 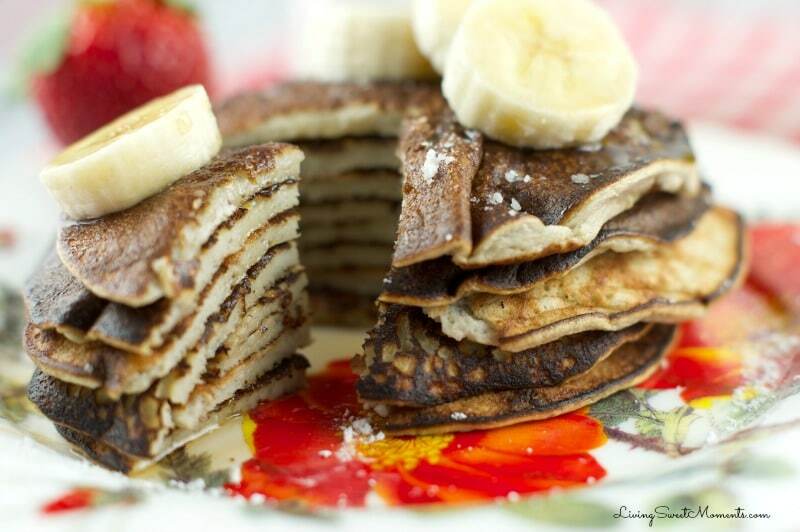 banana pancakes with peanut butter sound amazing! I was just made aware of this recipe this morning. Since I am out of hard boiled eggs, I was planning on making eggs for breakfast, so I gave this a whirl. It was very good! It was tricky to turn them, but I have that issue with wheat based pancakes as well. Sometimes they broke, which was no biggie as they still tasted good broken in half. 🙂 Thanks! Thanks for letting me know Kathy! I’m glad you liked them! I found this recipe on Pinterest last night and was so excited to make this this morning! After reading several comments and suggestions, here’s how I adapted the recipe: one farm fresh egg, one banana, one pinch of baking powder (saw that tip elsewhere), splash of vanilla, sprinkle of mini chocolate chips. Somehow, I had no cinnamon in my house. (I read that cuts down on the ripe banana flavor and makes a banana bread taste). I used some sugar cinnamon ice cream sprinkles (gotta work with what I’ve got!). 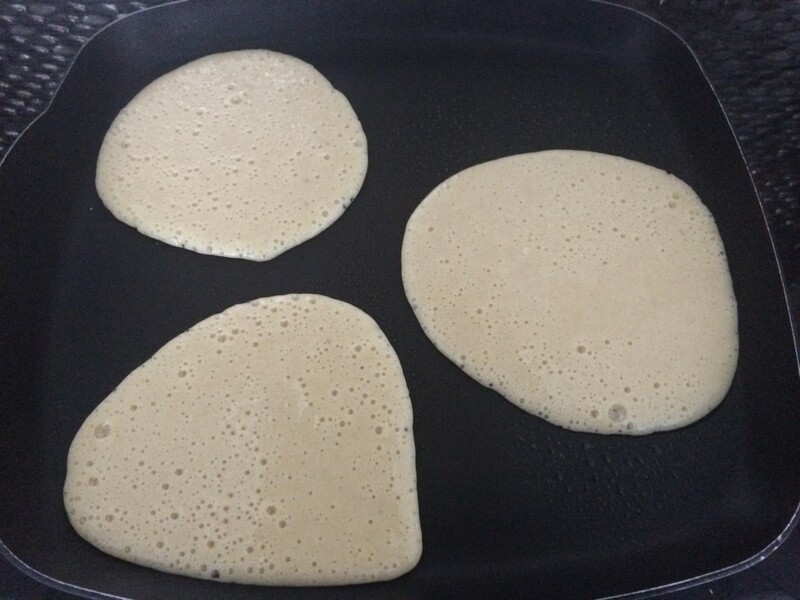 I cooked 4″ diameter pancakes on med-high heat (preheated my sprayed skillet). I couldn’t believe how fast they cooked! I sprayed my spatula with non-stick spray, so flipping was successful! These were a delicious treat this morning! I kept walking around the house saying to myself, “I can’t believe that was just an egg and a banana!” Thank you for sharing the recipe! Wow Chrissy your recipe sounds perfect with the addition of baking powder and chips. I’ll definitely try yours in a smaller pancake. Thanks for your comment and suggestions. Very fast to make! I put 2 eggs a banana and some cinnamon in my magic bullet. Poured the batter into a cooking sprayed pan and in a short time I had a giant pancake on my plate. Spread a little almond butter and raw honey on top and had an awesome breakfast before lifting weights later in the morning. Thanks for sharing such a easy high protein alternative to regular pancakes. yummm Ross! 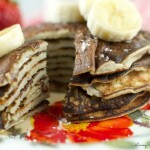 Almond butter sounds excellent with these pancakes! Glad you liked it! have you tried these for meal prep? Also, i tried this recipe and added half a pack of cinnamon oatmeal and but a small bit of butter on top, Delicious!! yummm I like that combination. OMG yum! I tried these pancakes and I am in heaven. I read all of the comments and decided to follow your original recipe but made sure the pan was hot. They came our so awesome. I am so glad you like them Patti! Who could’ve thought 2 ingredients would turn into pancakes! yay! Glad you liked them Marciel! thanks for the feedback! I tried these this morning and they were great! I put a couple Ghirardelli dark chocolate chips in them (didn’t work too great, but still delicious) and used a little peanut butter as syrup. Thanks for the great idea! Yay Katy! I’m glad you liked them…. My kind of syrup! That’s great Ryiin! thanks for the feedback! 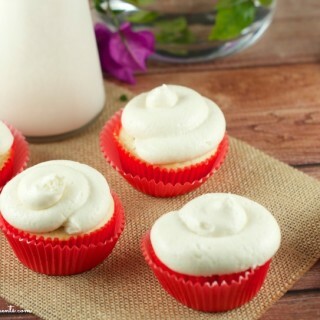 Just made them, great fresh taste of banana. People that are comparing these to regular flour pancakes are going to be upset. 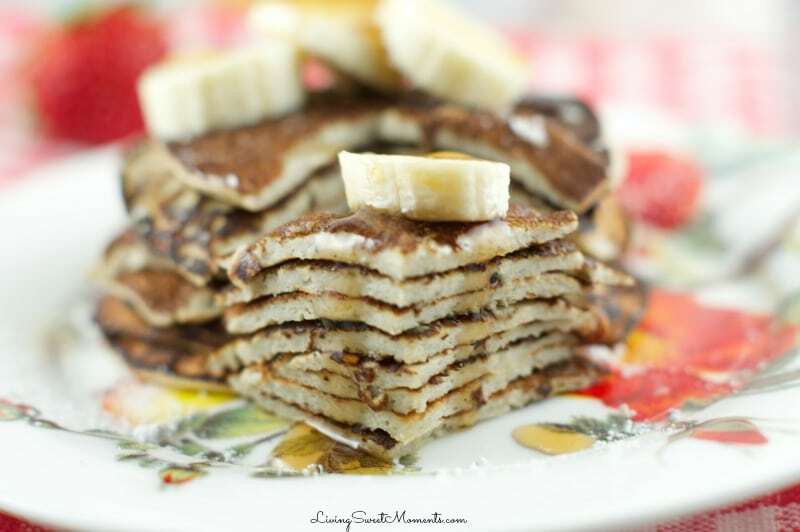 These are healthier and gluten free for those that miss there pancakes. I have been eating an gluten free oatmeal pancake for awhile so this was a nice change. I did however make 2 changes, I used egg whites (out of eggs) and I added a scoop of Vanilla Protein powder. Before I would flip them I would shack the pan, if it slides time to flip. Still had to keep on eye on the heat. Thanks for sharing. Thank you for your feedback, Rose! I’ve never tried them with only egg whites, I have a few frozen in my freezer and I’ll definitely use them next time I plan to make these pancakes. Also, thanks for the cooking tips. Have a great day! These were pretty good! I have to agree my first batch was not pretty…kind of mushy, difficult to flip but I think it’s because the heat wasn’t high enough. The next batch I cooked on a higher heat, they cooked faster, were a little darker and easy to flip. Very yummy and healthy! Thank you so much for this recipe. 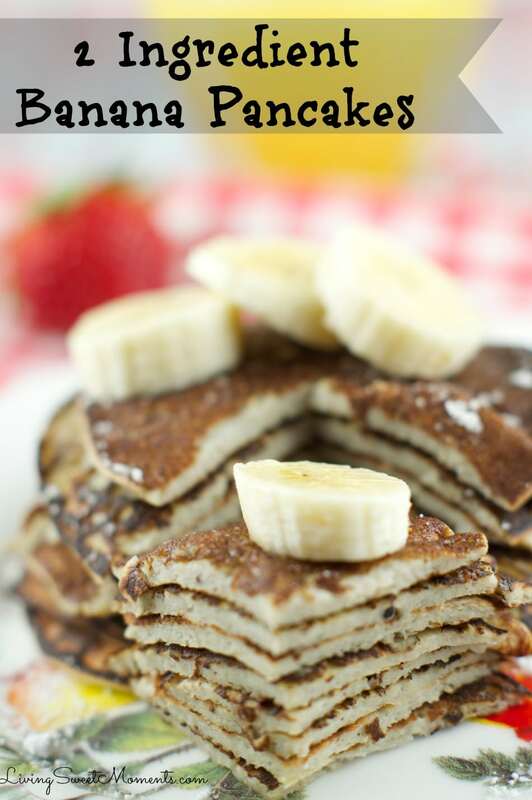 Mine turned out great and tasted just like banana pancakes—such a brilliant idea! 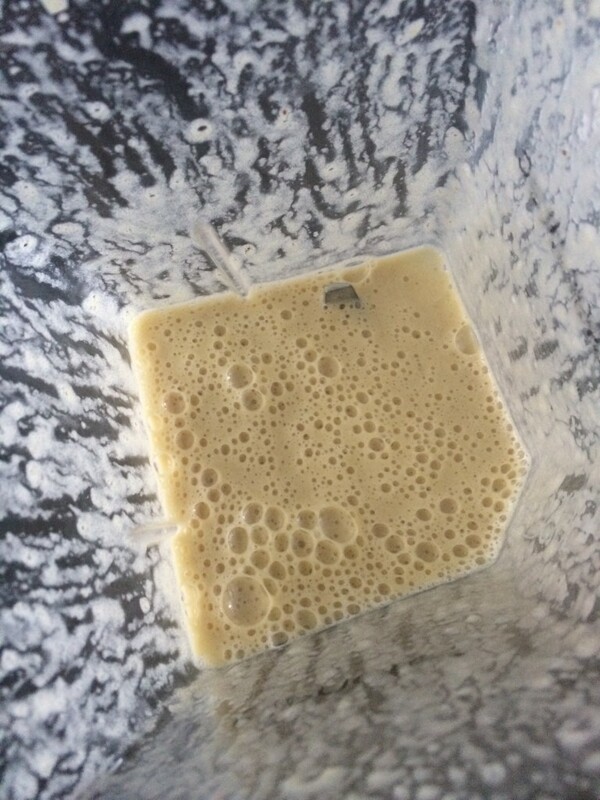 My batter was a good consistency, not too liquid, but I did add a teaspoon of flax seeds so that might have thickened them up slightly. Thanks for the feedback Kari! What a great idea to add flax to the batter. Hi! 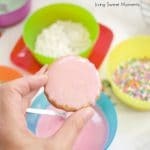 I came across this recipe last night and decided to give them a try for myself & my 8 month old this morning. We loved them! I put coconut oil in the pan and I used 1 banana and 1 egg a splash of vanilla and a little cinnamon. They turned out just like pancakes! 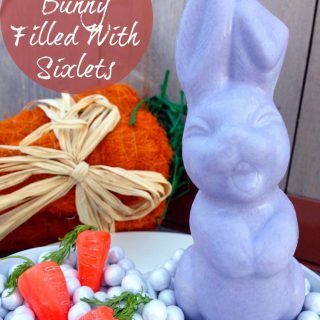 I’ll definitely be making these again! Thanks! Thanks for the feedback Krysten! Glad you and your baby liked them! Yay! Glad you liked them, Lisa! That pumpkin spice sounds like a great idea! On the nutritional facts give info for per serving what is the the serving size 1 pancake or what? I haven’t done it before D, so I can’t guarantee it would work. I absolutely loved these and they worked perfectly blending them with my stand mixture, preheated pan, flipped perfectly! Great job with this!!! Awesome April! Glad you enjoyed them! I made these for the first time today however the batter was so thin I decided to blend in a small amount of rolled oats ( I had gluten free on hand). They were delicious and cooked up perfectly! Just need to make sure the pan is hot enough before pouring the batter. Hi Diane! Great idea of adding the oats. Thanks for sharing! I tried these and could not flip them, they tasted good, but finally gave up! !they fell apart, so disappointed! Made these and love them so much! My 10 month old loves them too:) I added just a dash of cinnamon & a dash of vanilla when I blended it up. I’m wondering if anyone has experimented with baking them in a mini muffin tin? I’m not great at baking, so I’m not sure how or if it would work… but I’d like to make a bunch of them (in mini form) so that we can take them along as a breakfast snack! I know there are other recipes out there for this kind of thing, but I love the less is more approach with the ingredients. Hi Carlie! thanks for your feedback! I haven’t try baking them in muffin form since I’m afraid they’ll be a little too dense. Maybe by adding some baking powder it may help or by whipping the egg whites separately from the yolks and folding them in the batter. And doubled the banana and eggs. Awesome Donna! great idea on adding the flax seed!